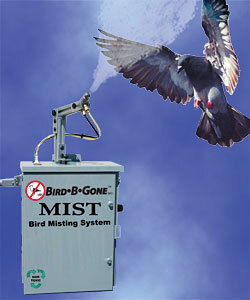 The hazing system releases a fine mist into the air to deter birds from large open spaces. The unit distributes methyl anthranilate, a grape extract effective in repelling pest birds. The extract irritates the birds' trigeminal nerve and mucous membranes through entry in the eyes, nose or mouth. Birds do not like the sensation caused by the extract and will take flight from the area being treated. The unit has a liquid-crystal-display touch screen for programming. From the control unit, users can attach up to 64 misting drop units, controlling each one individually. Each drop station can cover about 6,000-8,000 square feet.